Vigilantes have always existed, from the lone wolf pursuing a personal vendetta to groups of individuals dedicated to stamping out injustice and other such causes. Garuda is one such group, with the stated aim of protecting humanity from threats against which they cannot protect themselves. Many of its members are characterised by a strong sense of justice but a lack of faith in the abilities of the World Govenment to carry it out. Garuda consists largely of wealthy individuals, families and businesses who all wish to use their resources to fight crime and protect the people of the world. Their field work is often carried out by the superpowered individuals in their ranks. Garuda started from rather humble beginnings, and is one of the newer organisations around. 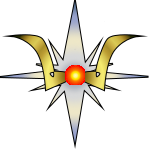 It first came into the public eye in 2038, when the heroes known as Firebrand and Battalion first became active. Firebrand was a man with the ability to superheat his surroundings, as well as the power of flight. Despite the destructive nature of his powers, his priority when arriving on a disaster scene was always the protection of civilians first and foremost. That said, he was still a force to be reckoned with on the battlefield as well. Battalion was a woman kitted out with more weapons than could be considered entirely reasonable. Blades, firearms, explosives, you name it, she had it. Rumour had it at the time that she had even replaced various parts of her body with weapons and other gadgets. She was far more ruthless than her partner, often dedicating herself to the elimination of threats before they became an issue. Public speculation placed a third member on the team, someone working in the shadows to provide the intelligence, resources and technology that the pair used. Those not in the know, which includes most members of Garuda, simply refer to them as The Boss. All that is known about them is that they were well-connected and had access to some fairly cutting edge technology for the times. As much good as they did, it wasn't enough. Three people alone can barely keep the crime rate in Capital City down, let alone achieve their dreams of protecting humanity. They needed to expand, and so Garuda began to recruit. Supers, of course, were always targeted for recruitment, due to being invaluable in the field, but Garuda also needed to expand its infrastructure. Scientists, businesses, landowners, anyone with anything to give and the willingness to use it for the common good was quickly snapped up. As Garuda expanded, they split into three separate divisions, each led by one of the group's founding members. The Boss was in charge of the Lyres, the group's intelligence division. Firebrand oversaw the Phoenix division, a rapid response and rescue team. And Battalion was in charge of Carrion, a combat heavy team employed in the direct elimination of threats to humanity. As they expanded, Garuda started making its presence known worldwide, fighting corruption, saving lives, and ending those deemed too dangerous to leave be. They quickly became a very divisive group, believed to be either a force for good where the World Government cannot or will not act, or a rogue faction taking the law into their own hands who need to be put down. Garuda has come a long way from its beginnings as a three-person justice squad. As well as the supers and other field agents, Garuda has the backing of a number of well-off individuals and businesses, although the identities of these backers remain unknown. They often clash with the World Government and SPEAR due to their operating outside the restraints of the law and the fact that they can often get in each other's way when responding to a crisis. More accomplished members of Garuda (OC Note: Those with the Rank (+2) Trope,) tend to have priority on use of the organisation's resources. Notably, this includes the Starlings, although their misuse will normally result in a reprimand and possible demotion. The Quetzalcoatl is also only available to ranking members, and even then, only in extreme situations. In addition, their opinions will hold a lot of weight with the various higher ups. Garuda still has the three main divisions it had when it first started to expand, although membership has changed over the years. Still headed up by The Boss, as far as anyone knows, the Lyres are Garuda's main intelligence agency. Their main job is to keep watch for potential threats and gathering information on known ones. They have also been known to conduct industrial espionage for the purpose of keeping Garuda’s technology at the cutting edge. It also contains a large number of socialites and businessmen dedicated to protecting the group's interests, such as by recruiting and providing funds. Led by Blitz, who recently took over from her father, Firebrand, Phoenix is Garuda's rapid response and rescue division. They are the branch most often in the public eye. Typically consisting of scouts and medics, their job is to ensure the safe evacuation from disaster areas. Garuda puts great value on human life, so it is only in times of dire need that the Carrion are deployed. Consisting of the organisation’s best fighters, the purpose of the Carrion is to eliminate the source of the problem as quickly and efficiently as possible with minimal collateral damage. With every super villain worth their salt converging on Capital City, they are currently on a state of constant alert. The current head of Carrion is known only as Ranger. A disproportionate number of Garuda's membership are incredibly wealthy, and use whatever they have to provide for the group. Despite this, numbers are low and they would be hard pressed to fight in a long, drawn out conflict. These are some of the resources available to Garuda. Garuda does not have one centralised base, at least not as far as the public is aware. Various individuals operate out of their homes and businesses, while the rank and file of the group can be found in various hidden barracks and the mobile headquarters, Leviathan. Leviathan: A submarine/aircraft carrier combination. Practically a mobile fortress, and almost invisible when required, taking it out would be a challenge for anyone. While surfaced, the sub can launch planes which are used for rapid deployment of field agents. While it needs to surface frequently to take on air, Leviathan is capable of operating for years at a time without docking. Starlings: Jump jets launched from the Leviathan and other hidden bases. Lightly armed, but able to get you where you need to be in short order. Quetzalcoatl: A flying mecha/plane hybrid. Much more heavily armed than the starlings, Quetzalcoatl is the mechanical embodiment of the storm, able to deploy sight-obscuring smokescreens, and using lightning guns as its primary weaponry. While it sees use by a number of Garuda's members, it's most frequent pilot is Phoenix division's second in command, Aztec. For reasons of security, most of the high profile members of Garuda are not known by their public identity. These are the active heroes confirmed or rumoured to be working for them. Founder of the Lyres and rumoured head of Garuda. Still doing what they have been since the beginning, and still a complete unknown. Founder of the Phoenix division. Firebrand is certainly getting on in years, and well past his prime. He gave up the position of head of Phoenix to his daughter, Blitz, and faded into obscurity. Nontheless, it seems unlikely that he'd simply abandon the organisation, and is likely still working behind the scenes, possibly for the Lyres. Founder of the Carrion Division. Very little has been seen of her lately, and it may be that she is no longer part of the organisation. Still, a woman matching her description has been sighted in the streets of Capital city at night from time to time. Daughter of Firebrand and his successor as head of Phoenix. Blitz is known for her strong sense of justice and incredibly powerful lightning based abilities. However, she is new to her role and lacks the experience of her predecessor. Time will tell how well she takes to her new role. Second in command of the Phoenix division. Aztec maintains and occasionally pilots the mecha, Quetzalcoatl. The head of Carrion. Ranger's identity is not known even to most members of the division. The Boss probably knows, but they're not talking. On the battlefield, Ranger is a ghost, taking out opponents at range with firearms and being out of there before anyone knows what's happening. An emissary of the higher ups in the Lyres who, by necessity, need to keep their identities hidden. While somewhat overly theatrical, he is nonetheless an effective field agent and acts as a point of contact for the lower ranks in the division. The following views of various organisations are those you would expect most members of Garuda to express, although not all members will think the same way. They're too focussed on the bigger picture to care about individual lives, and they're the main reason we have to stay so hidden. That, and both of us showing up at a disaster area tends to make things worse, not better. Still, they seem fairly effective at keeping the peace whenever they care to act, and they keep people like the Heart and the Seperatists in check. Even if you're not a fan of the government, this lot can't be the only alternative. The chaos that could ensue if they actually succeed is not what the world needs. A league of superpowered criminals? Way too dangerous to leave unchecked, and the world would be a better place if they all just upped and vanished. At least they're fairly open in their intentions. Who even are these people? Seriously, someone needs to get on this, they're too much of an unknown factor. Well, if this somehow results in actually getting people to work together good for them I guess. If nothing else, these meetings are going to be prime opportunities to gather information and getting some insight into other organisations and scope out potential threats.